Its origin is unclear, possibly indigenous to South-east Asia and/or Africa. Achyranthes aspera is naturalised in most countries in the tropics and sub-tropics. Achyranthes aspera is invasive in parts of Kenya, Tanzania and Uganda (CABI Invasive Species Compendium).It is widespread in disturbed sites, especially along roadsides. Disturbed areas, road sides, gardens, crops, grasslands, savanna and forest margins. This species is often found in the moist or shaded areas near trees in savanna or pasture lands where it grows in dense thickets. Achyranthes aspera is an erect or spreading long-lived (perennial) herb which can grow up to 2 m tall. Its stems become woody at the base. It short-stalked leaves (dark green above and paler below) are opposite, simple and egg-shaped with broad end at base (ovate) up to 10 cm long by 8 cm wide, densely to sparsely hairy (pubescent) tapering to a point at both ends and shortly stalked. 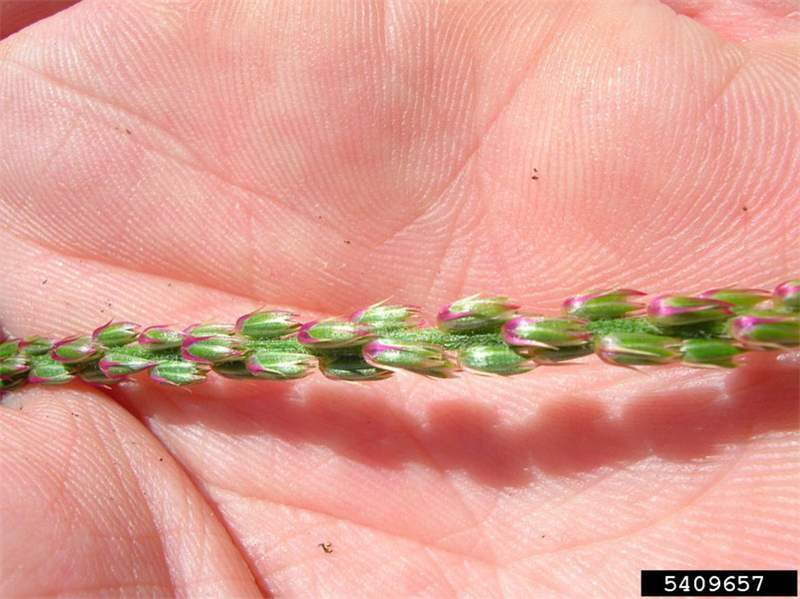 The small greenish-white flowers form narrow, elongated terminal spikes up to 60 cm long. As the flowers age, they bend downwards and become pressed closely against the stem. The bracts surrounding the flowers in the fruiting stage have sharp, pointed tips making the heads spiny to the touch. The sharp-pointed fruits are orange to reddish purple or straw-brown capsules. A. aspera is a variable species divided into six varieties, two of which have been documented from East Africa (Desta 1994): A. aspera var. 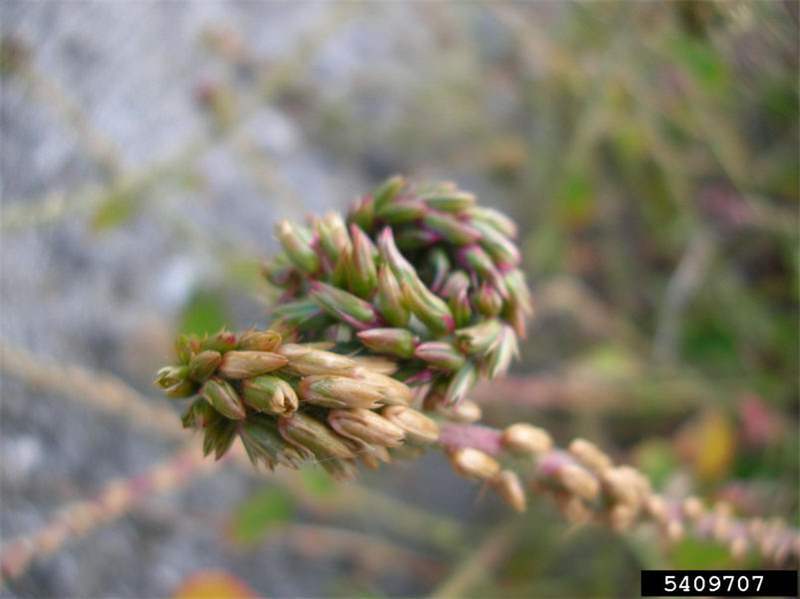 aspera has a long perianth (the outer envelope of a flower, consisting of either the calyx or the corolla, or both) and leaves with a pointed tip (acuminate apex); A. aspera var. indica has a short perianth and blunt leaves. The sharp-pointed fruits stick to hairs of animals and clothes. They can be dispersed by livestock and wild animals and by people on footwear and clothing. Achyranthes aspera is a medicinal plant and can also be used as a diuretic for goats and for other veterinary purposes. Achyranthes aspera is a pan-tropical weed. It is common in disturbed areas and gardens. It is an agricultural weed and a problem in shaded pastures. 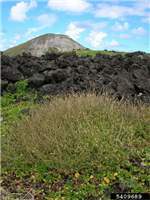 It is also considered to have a negative impact on biodiversity. 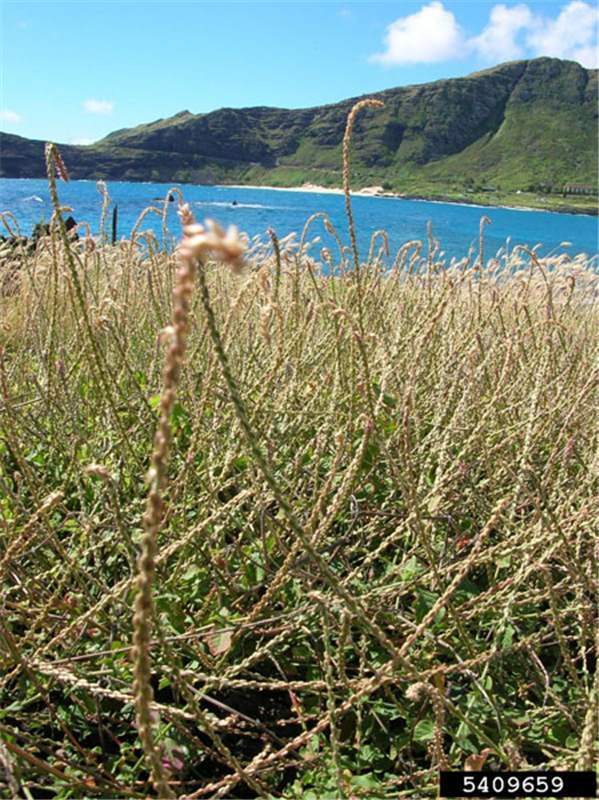 A. aspera has been listed as a noxious weed in South Africa (prohibited plants that must be controlled. They serve no economic purpose and possess characteristics that are harmful to humans, animals or the environment). The best form of invasive species management is prevention. As Achyranthes aspera is so widespread this is unlikely to be possible in many instances. If prevention is no longer possible, it is best to treat the weed infestations when they are small to prevent them from establishing (early detection and rapid response). Controlling the weed before it seeds will reduce future problems. Control is generally best applied to the least infested areas before dense infestations are tackled. Consistent follow-up work is required for sustainable management. Regular and timely slashing will encourage dominance of desirable species. 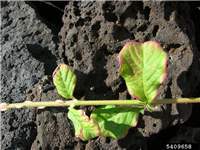 A. aspera can be controlled by herbicide but herbicide-resistance has been documented. Not listed as a noxious weed by any state or government authorities in Kenya, Tanzania or Uganda. 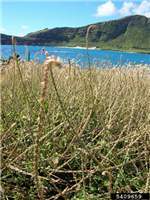 CABI invasive species compendium online data sheet. Achyranthes aspera (devil's horsewhip). CABI Publishing 2011. www.cabi.org/ISC. Accessed March 2011. Desta, B. (1994). Ethiopian traditional herbal drugs Part III. 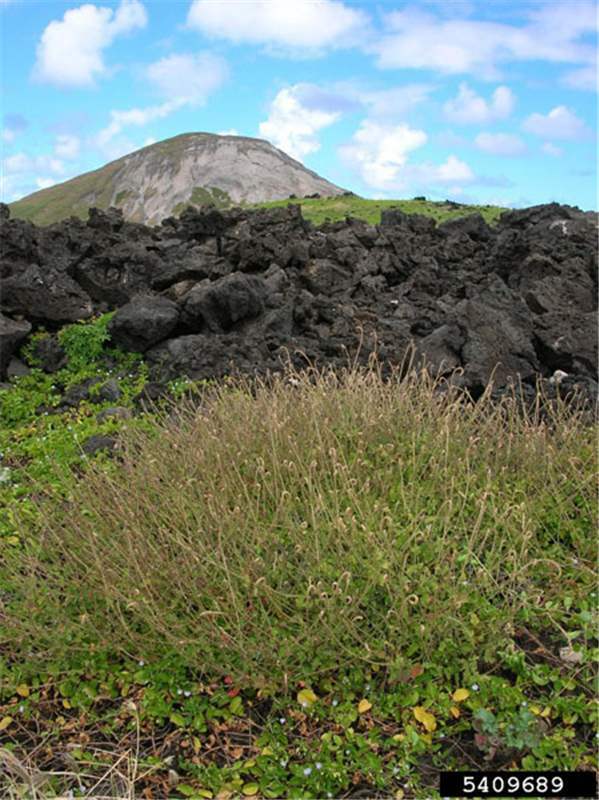 Anti-fertility Activity of 70 medicinal plants. Journal of Ethnopharmacology. 44:199-209.